A former paratrooper has told the Ballymurphy Inquest that bullets flew around his head as he came under fire from an unknown gunman. 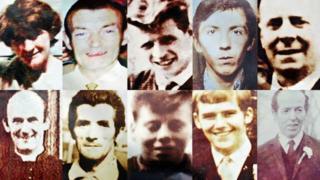 The inquest is examining the deaths of 10 people in west Belfast in August 1971. Soldier M1300 was a lance corporal clerk in B Company, 2 Para during the introduction of internment on 9 August 1971. Six people died as a result of fatal gunshot wounds in the area that day. M1300 said he was in Company HQ in Vere Foster school when he was tasked with taking ammunition to a sangar on the roof of the school. As he made his way along the flat roof with two bandoliers of 50 rounds each, he said he came under fire from what he thought was a Thompson sub-machine gun. He now believes the shooting came from the direction of the Moyard Flats nearby. M1300 said he threw himself to the ground during the 15 seconds of gunfire. "They did not miss me by much," he said. He added that he did not hear any return fire from other soldiers, and that he went on to deliver the ammunition to the sangar before getting off the roof as quickly as he could. "I was not in the frame of mind to hang around as it was the first time I had been shot at," the former soldier added. The existence of gunmen in the Moyard Flats has always been in dispute. M1300 said he later accompanied his company commander to the Henry Taggart Hall where he usually slept. He explained that he caught a glimpse of a civilian, a wounded man in his 30s. M1300 said the wounded man was lying face up on his bed. "That was a shock," he told the court. "I'd never seen anybody in that condition before... he was bleeding quite heavily." M1300 did not remember soldiers shooting out through the windows of the base. He said he had since heard that the Henry Taggart base had been fortified to be like "something akin to Rorke's Drift", a reference to the mission station depicted in the film "Zulu", set during the Anglo-Zulu war. But M1300 said he "didn't see any evidence of that whatsoever". M1300 also said he hadn't been a typical paratrooper and "was very much a loner". "I wasn't, if you like, one of the gang." he said. "My background and education set me apart from the others. That's how I ended up in Company HQ." "I was in shock that evening, that's why I don't really remember a lot." Earlier soldier M140, a former private in B Company, 2 Para also appeared in the witness box. On the day of the introduction of internment, he recalled being in a sangar on the roof of Vere Foster school, but had no memory of being under fire or of discharging his weapon. He told the court he had later seen civilians in the Henry Taggart base, but had not seen any bodies. He said he was unsure if any of them had been wounded.